Democrat bill could make journalists a protected class. Democratic lawmakers have introduced a bill to make “attacking” or “attempting to attack” a journalist a federal crime. Three Democratic lawmakers reintroduced a Journalist Protection Act that intends to designate “certain attacks on those reporting the news” as a federal crime. The bill was introduced by Rep. Eric Swalwell (D-Calif.), Sen. Richard Blumenthal (D-Conn.) and Sen. Bob Menendez (D-N.J.). The lawmakers said they were introducing the bill as a response to President Trump’s “climate of extreme hostility” toward the media. In effect, this is the same process as making it a federal “hate crime” to attack a journo. You can read the full text of the bill here. 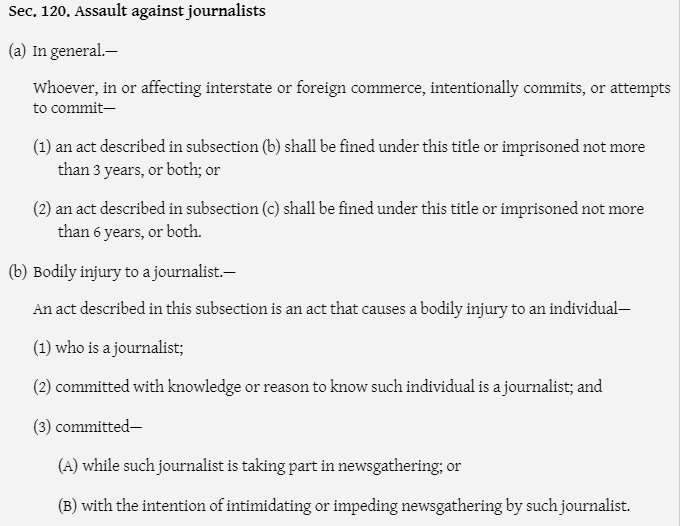 The text says anyone who “intentionally commits or attempts to commit … bodily injury to a journalist” shall be “fined under this title or imprisoned” for 3 to 6 years. Sen. Menendez claimed on Twitter that “threats of violence” alone would classify as a federal crime under the bill. With our Journalist Protection Act, @SenBlumenthal, @RepSwalwell and I will make physical attacks and threats of violence against working journalists a federal crime. Physical attacks against members of the media will NOT be tolerated. It’s not enough that journos are a protected class on social media who can get all their critics banned merely for tweeting “learn to code” at them — they need it enshrined in federal law that they’re a class above us. Incidentally, while Rep. Swalwell claims to be deeply concerned with protecting the First Amendment rights of journos, last year he suggested he would use nuclear weapons against American citizens who resisted his plan to gut the Second Amendment through mandatory gun confiscations.